Pair of Grete Jalk easy chairs, Denmark, 1960s. Excellent condition. New cushions, reupholstered. Great pair of easy chairs by Grete Jalk, Denmark, 1950s. 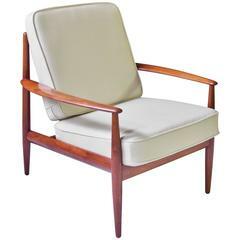 Grete Jalk teak easy chair, very good condition, the teak frame is in a really fantastic condition, new upholstery and new woven fabric in petrol. Fantastic look! 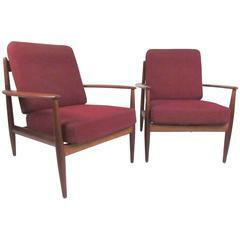 First edition pair of Grete Jalk lounge chairs, Denmark, 1960s for France & Son. Excellent condition. New cushions, freshly reupholstered. Perfect condition. Pair of Grete Jalk lounge chairs, Denmark, 1960s. Excellent condition. New cushions, freshly reupholstered. Perfect condition. 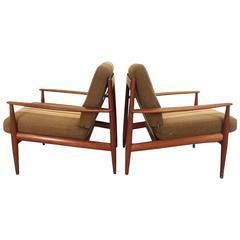 Pair of Grete Jalk teak lounge chairs for France & Søn. Very eye appealing, with nice curves. Vintage Danish chairs designed by Grete Jalk. Featuring long arms, tapered legs and rope or banded seat and back. (Please confirm item location with dealer).